Born: As Richard Timothy Smith on March 25th, 1942 in Cheltenham, Gloucestershire, England. 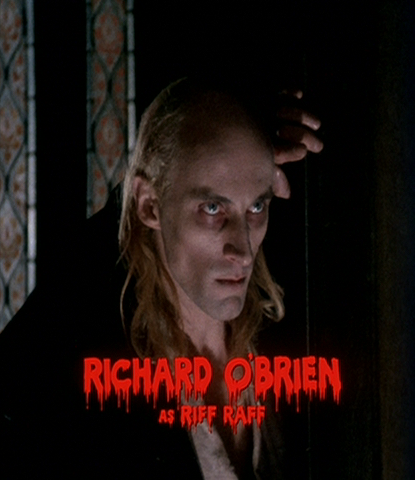 In Rocky Horror circles, Richard "Ritz" O'Brien is simply... the creator. He wrote the book, music, and lyrics for the Rocky Horror Show musical in 1973, and originated the role of Riff Raff in its original London production. The play's 1975 film adaptation, The Rocky Horror Picture Show (in which he again played Riff Raff), spawned the massive cult following that is the reason most of us are here. Outside of Rocky Horror he's known for his other stage and film work while in the U.K. he's also widely recognized as "Reckless Rick", host of the wildly popular early 90s BBC game show The Crystal Maze. Richard's family emigrated from England to New Zealand in 1951, when his father (an accountant at the time) decided to become a sheep farmer. In 1964 he moved back to England to pursue a (obviously successful) career in entertainment. Richard has been married (and divorced) twice, to Transylvanian Kimi Wong and later Jane Moss. However he dislikes sexual labels and refuses to refer to himself as straight, gay, or bi. At a 2007 charity auction, he declared that "I have slept with 300 women, 30 or 40 men and around 12 transsexuals". Sweet Transvestite 7" Single by The Original London Cast of The Rocky Horror Show (1973) - Backed with Time Warp. The Rocky Horror Show (Original London Cast) (1973) - Royal Court Theatre Upstairs in London. Featuring Tim Curry, Richard O'Brien, Patricia Quinn, Little Nell, Jonathan Adams, et al. The Rocky Horror Picture Show Radio Spots 7" Single by 20th Century Fox (1975) - One-sided 33 1/3 RPM. Voiced by Richard O'Brien. Shock Treatment 7" Single (1981) - Promotional single. Richard O'Brien solo version, backed with "Overture". Time Warp (1995-10-21) by 20th Anniversary Ensemble Cast (4:48) - 240 kbps MP3 or 29.8 MB lossless FLAC sound files available. Richard O'Brien, Patricia Quinn, and Dori Hartley perform this live version of The Time Warp at the 20th Anniversary Convention. Can also hear Sal Piro at the beginning ("It's Time Warp time!"). Super Heroes (1995-10-21) by Richard O'Brien (2:34) - 218 kbps MP3 or 14.0 MB lossless FLAC sound files available. Performed live at the 20th Anniversary Convention in Los Angeles. Rocky Horror Radio Spots (Music :60) (0:57) - 223 kbps MP3 or 4.7 MB lossless FLAC sound files available. From The Rocky Horror Picture Show Radio Spots 7" Single by 20th Century Fox (1975). Rocky Horror Radio Spots (Music :30) (0:30) - 217 kbps MP3 or 2.4 MB lossless FLAC sound files available. From The Rocky Horror Picture Show Radio Spots 7" Single by 20th Century Fox (1975). Rocky Horror Radio Spots (Belt in Mouth) (0:31) - 146 kbps MP3 or 1.8 MB lossless FLAC sound files available. From The Rocky Horror Picture Show Radio Spots 7" Single by 20th Century Fox (1975). Rocky Horror Radio Spots (Get Mother) (0:29) - 216 kbps MP3 or 2.1 MB lossless FLAC sound files available. From The Rocky Horror Picture Show Radio Spots 7" Single by 20th Century Fox (1975). Rocky Horror Radio Spots (Football Player) (0:30) - 215 kbps MP3 or 2.2 MB lossless FLAC sound files available. From The Rocky Horror Picture Show Radio Spots 7" Single by 20th Century Fox (1975). Rocky Horror Radio Spots (Wall Street Broker) (0:27) - 217 kbps MP3 or 2.0 MB lossless FLAC sound files available. From The Rocky Horror Picture Show Radio Spots 7" Single by 20th Century Fox (1975). Rocky Horror Radio Spots (Letter To Nixon) (0:30) - 222 kbps MP3 or 2.3 MB lossless FLAC sound files available. From The Rocky Horror Picture Show Radio Spots 7" Single by 20th Century Fox (1975). Revenge of the Old Queen (Draft Script) - An unfilmed sequel to The Rocky Horror Picture Show. Book and lyrics by Richard O'Brien. Transcribed by Jason Alan Pfaff. 16,276 word HTML document, 130 KB. Richard O'Brien Interview (1979) - By Patricia Morrisroe, from the Rocky Horror Picture Show Official 1979 Magazine. Richard O'Brien is the creator of The Rocky Horror Show and The Rocky Horror Picture Show. 1,956 word HTML document, 12 KB. Rocky Horror Show (1970s Era Script) - Book, music, and lyrics by Richard O'Brien. 5,760 word HTML document, 47 KB. Rocky Horror Show (1999 Script) - Book, music, and lyrics by Richard O'Brien. 8,080 word HTML document, 97 KB.